What Is Use Of DVNAPHARMACYMS ? DVNAPHARMACYMS is a software which is suitable for pharmacy shop. It is covering pharmacy shop management system activity. Those clients have very big shop and rate of customer entry is very high as well as medicine sold. They are attempting to make efficient work as well as cost effective and accuracy. It is accelerating the medicine shop activity. It is user friendly, easy to learn and enthusiastic software for a learner. This software is attempted by the owner of hospital, whole seller and retailer. It is reducing the manual paper works. You can manage one shop as well as multiple shops from one location or multiple locations by using single software. You can use it as online as well as offline because it is browser based software and works solution. You can deploy it on one server and use it on multiple work stations. It is independent of client or desktop machine. You can replace your client machine or desktop many times. How Can I Purchase DVNAPHARMACYMS ? If you want to purchase pharmacy management software online. We are providing online purchase option to our customer. Click on Order Now Online option is quick and easy option. Here you can pay Rs 5000 for standard pharmacy management software. Our software implementation engineer will contact you after getting successful payment of Rs 5000. They will take all necessary action or responsibility for your project. You can purchase it by your credit card or internet banking etc. 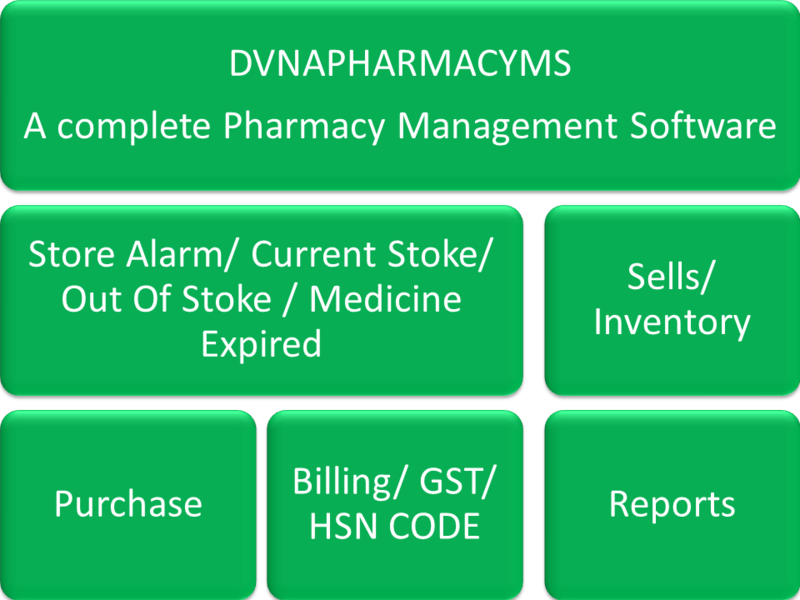 DVNAPHARMACYMS is covering many modules and features like payroll, billing, reporting, and store alarm, out of stoke, stoke in & out, GST and HSN etc. What Is Technical Details Of DVNAPHARMACYMS ? DVNAPHARMACYMS is developed in visual studio and its three layers are user interface layer, business logic layer and database layer. All these layers coding is separate and independent. Business logic layer is developed by highly qualified and experienced professional. It is secured and tested by highly qualified and experienced engineers. Its backend layer is MSSQL Server which is manageable and easy to understand by database professionals. Minimum hardware requirement is i3 processor, 4 GB RAM, Windows operating system. It will supports all windows operating system either client or server. It is a browser based solution. DVNAPHARMACYMS is easy to learn and use. It is user friendly. Its maintenance cost is very low and affordable by all type of client. It will take maximum one week to learn and implement in whole seller, retailer or individual customer. Its costs will be between Rs 5,000 to Rs 10,000 for individual, retailer and whole seller. What Is Technical Support ? We are providing two types of technical supports on DVNAPHARMACYMS. These supports are called remote supports and onsite supports. In case of remote supports we are providing all technical supports through phone or remote desktop connection. It is also custom software and all change will be done according to customer need. Our development team is fully dedicated to customize. Customization cost will be bear by client. Its cost will vary from client to client and her/ his requirement.